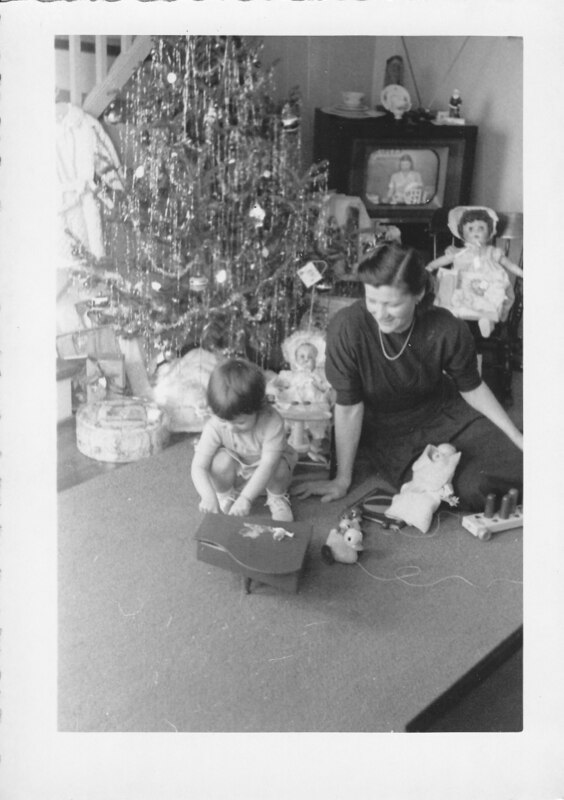 This is post #21 in the GeneaBloggers Advent Calendar of Christmas Memories. I admit it. When not listening to audiobooks on my commute during the Christmas season, I’m tuned in to one of the DC/Baltimore radio stations that play only Christmas music. Usually grinning as they play one of my faves. I prefer the oldies-but-goodies — sung by the likes of Burl Ives and Nat King Cole. I also like the more recent, humorous ones like “Crabs for Christmas” and “The 12 Things at Christmas that are Such a Pain to Me.” However, I can only enjoy the latter in small doses. My absolute favorite Christmas music is probably that performed by the Vince Guaraldi Trio for the “A Charlie Brown Christmas” special. Growing up, I had several Christmas records that I enjoyed listening to. One featured “Frosty the Snowman” and another that I remember clearly had songs sung by a boys’ choir. I have my mom’s four-CD set “Joy to the World” by the Mormon Tabernacle Choir. I’ve never been caroling, but I do remember a group of neighbors doing so when I was little. It was neat when they visited our house. “Good King Wenceslas” is one of the first tunes I learned to play on the piano — it’s not very popular on the radio, but it’s a sentimental favorite. 1. What is your all-time favorite song? Yep, number 1. It’s hard to choose sometimes. If you made your favorite all-time Top 40 music selections, what would be #1? 2. Tell us about it. Why is it a favorite? Do you have special memories attached to this song? 3. Write your own blog post about it, or make a comment on this post or on the Facebook entry. I simply cannot pick one all-time favorite song, however, this mission did remind me of the first cassette I ever owned. It was given to me by my parents for my 7th birthday along with a turquoise Realistic radio (the kind with a cassette slot that operated exactly like a pop-up toaster). I loved the radio and I loved the cassette, which I played over and over and over. The cassette, “Fire & Ice,” was a compilation of music from the likes of Blondie, Abba, The Manhattan Transfer, Bonnie Raitt, The Pointer Sisters, Diana Ross, Kim Carnes, Pat Benatar, The Pretenders. The list goes on and on. It was awesome. To this day, many of the songs on that cassette are among my favorites.